Have you ever wondered what to do when you lose your car keys, or if the key breaks in the keyhole and there's no help in sight? Don't worry. You can still manage to turn on the engine and drive away. Hotwiring will probably work only on those cars that have been manufactured in the mid-'90s or before. Hotwiring is a process of starting a car engine without using a key. Ordinarily, when the key is turned, it completes the circuit between the battery, ignition/electrical system, and the starter motor, resulting in the engine turning on. Hotwiring involves directly completing this circuit without the lock-key mechanism getting involved. This process involves significant risk of electrical shock, so care needs to be taken. Hotwiring may cause damage to the wiring and/or the steering lock system, and should be carried out only in case of an emergency. Use this last resort on your own car only. Make sure that the car is in neutral, with the hand brake applied. ■ First, insert a screwdriver into the ignition tumbler (the place you insert your key) and turn it. If this works, your car will start right away, and won't need hotwiring. ■ If the above step doesn't work, you will have to hotwire your car. Look at the steering column. It will have access panels near it. ■ Remove the panels of the steering column. You will encounter several bundles of wires. One bundle will supply the car lights, cruiser control, etc., with electricity. Another bundle will supply the wipers, seat warmers, etc., with electric current. The third bundle leads to the car battery, ignition, and electrical systems, that go up to the steering column. In the bundles, there will be wires leading to the battery, wires for the ignition/electrical system, and wires for the starter motor. There is no fixed color coding for wires of all cars. You may have to check your car manual to identify the wires. ■ Identify and separate the wire that leads to the battery and the one leading to the ignition/electrical system. ■ Remove a little insulation from the ends of both wires using a wire clipper. Then twist the bare ends together (preferably tape them). This should turn on electric supply to the radio, lights, and ignition. The engine is now ready to fire. ■ Locate the wire for the starter motor (mostly brown-colored). Cut off some insulation at the end. ■ Simply touch the bare end of the above wire to the bare ends of the joint red wires. The engine will turn on. Rev the engine to keep it running. Try to remove the shaft from the back of the steering column. Find a disc with holes that the lock fits into. Using a screwdriver, remove this disc. Try to remove the keyhole with a screwdriver. A spring will come loose, disabling the steering lock. This method works only on a few car models. Try to force-turn the steering wheel to the extreme until you heard the lock break. This method is based on sheer effort and may yield results. When driving, keep the starter wire covered with duct tape and separated from the joint wires, to prevent draining of the engine. 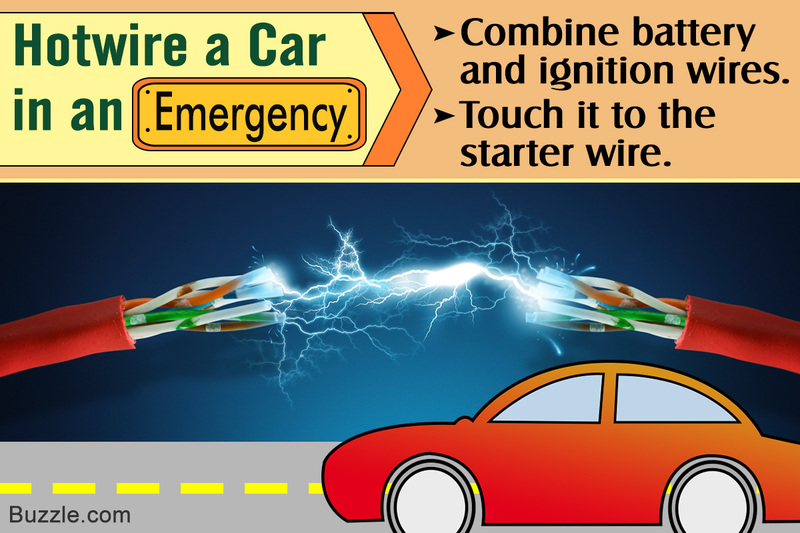 To turn off the engine, just separate the ignition/electrical wire from the battery wire. Take care to prevent any chances of the wires shorting with any car component. Take a drill and start drilling into the keyhole about two-third of the way up from below. Drill in as deep as the key would normally go. While drilling, remove the drill from the keyhole a couple of times. This is because each lock pin has two sections and a spring. When the drill bit is removed, they will fall into position. Simply insert a screwdriver in the keyhole and turn it to make the engine come to life. You need not insert the screwdriver in too deep, as the lock is broken. Note: This method will destroy the ignition lock, making it easy for anyone else with a screwdriver to start/steal your car in the future. Therefore, get the lock replaced/repaired by a mechanic as soon as possible. Now you know how to hotwire your car in case you are caught up in an emergency. If nothing works, you can try connecting the starter solenoid with the positive terminal of the car battery to fire up the engine. These methods will help you when you really need to start your car in an emergency. Make sure you are doing this only on your own car, and you have the registration documents at hand. Otherwise, it is illegal and would land you in prison for theft. Modern cars are equipped with microchip and transponder systems for unlocking the ignition, and hotwiring them may set off an alarm.